Sweetwater Sound has announced that GearFest 2017 was a bigger success than ever, breaking every record established by previous GearFest events. Launched in 2002, Sweetwater’s free, annual GearFest is the nation’s largest customer-focused music and pro audio festival and trade show, featuring exhibits from manufacturers, workshops, clinics, seminars, live demos, special performances, a musician’s flea market, and much more. This year’s two-day event, which took place June 23 and 24 at Sweetwater’s corporate headquarters in Fort Wayne, Indiana, provided more opportunities than ever before for thousands of musicians, engineers, and producers to participate in the festivities, with customers traveling from all over the world to attend. Attendance was record-breaking, with more than 14,000 participants, up 20% over 2016, and with sales up by 44% over last year. Featured guests include Grammy Award-winning producer/engineers Al Schmitt, Chris Lord-Alge, and Chuck Ainlay. Famed musicians include virtuoso guitarist Eric Johnson; Dweezil Zappa discussing and performing Frank Zappa’s music, Steve Stevens, guitarist for Billy Idol and Michael Jackson; guitarist Andy Timmons, who has performed with everyone from Joe Satriani to the Beach Boys; Rock & Roll Hall of Famer and Earth, Wind & Fire keyboardist Larry Dunn; bassist and vocalist Rhonda Smith, who has toured with Prince, Beyonce, Jeff Beck, and many others; renowned blues/jazz guitarist Robben Ford, who in addition to being a founding member of the Yellowjackets and successful solo artist, performed with Miles Davis, George Harrison, and Joni Mitchell; Terry Bozzio, drummer for Frank Zappa, Missing Persons, Duran Duran, and Deborah Harry; and Omar Hakim, drummer for countless A-list artists including Miles Davis, Sting, Weather Report, Madonna, David Bowie, and Michael Jackson. In total, GearFest included more than 200 workshops and seminars, including sessions on guitar, recording, live sound, music creation with computers, acoustics, songwriting, and how to use electronic instruments. Housed in more than 20 tents, more than 400 manufacturers of musical instruments, music technology, and pro audio equipment were on hand to provide GearFest attendees a look at the latest gear. 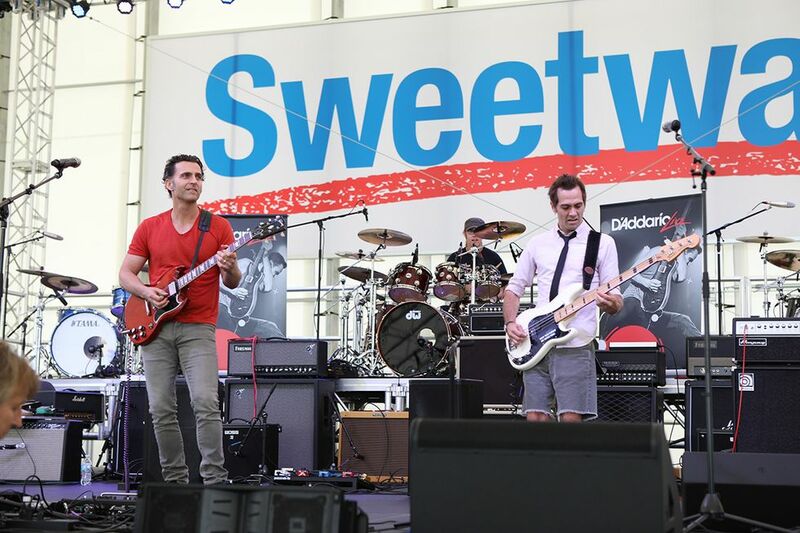 Sweetwater’s outdoor pavilion played host to a customer appreciation concert and party at the end of the first day, with music provided by the Sweetwater All Stars, joined by 21 of the visiting artists. Also, pavilion performances by Dweezil Zappa and Eric Johnson were, respectively, Friday’s and Saturday’s concluding events. For the second year, Sweetwater offered free camping for tents and RVs. For those who couldn’t attend GearFest in person, videos, photos, and updates were posted on Sweetwater’s popular FaceBook page, as well as on YouTube, Instagram, and Twitter. For those in attendance, the opportunities for social media interaction included taking pictures in front of a Marshall Amp Wall, and drum kits owned by Terry Bozzio and Eric Singer of KISS. Using the hashtag #gearfest, attendees could view their social media posts on a large display in Sweetwater’s Downbeat Diner. Estimated total attendee posts for the two days was more than 20,000. In addition, hourly prizes were given away, totaling more than $50,000 worth of music instruments and equipment.